← Walk the lost Beacon Place with Lichfield Discovered tonight! As predicted here a couple of weeks ago, the announcement by Walsall Council has now been made, and a leaflet is currently being circulated regarding reducing collections of your grey non-recycling bin to once every two weeks – interestingly, the announce meant is directly following the local elections. Whilst some folk have scoffed at this curious incidence of timing happenstance, it still seems rather convenient. If it’s a coincidence, it’s typical Walsall – why run the cost of two separate leaflets a few weeks apart when they could have been rolled into one? Anyway, here’s the leaflet you’ll be getting delivered. The change doesn’t come in until October 2016, and in certain circumstances you can order a larger bin, but for households with less than four occupants, the council will want proof you need one. Good luck with that. Bin leaflet part one – click for a full-size version. 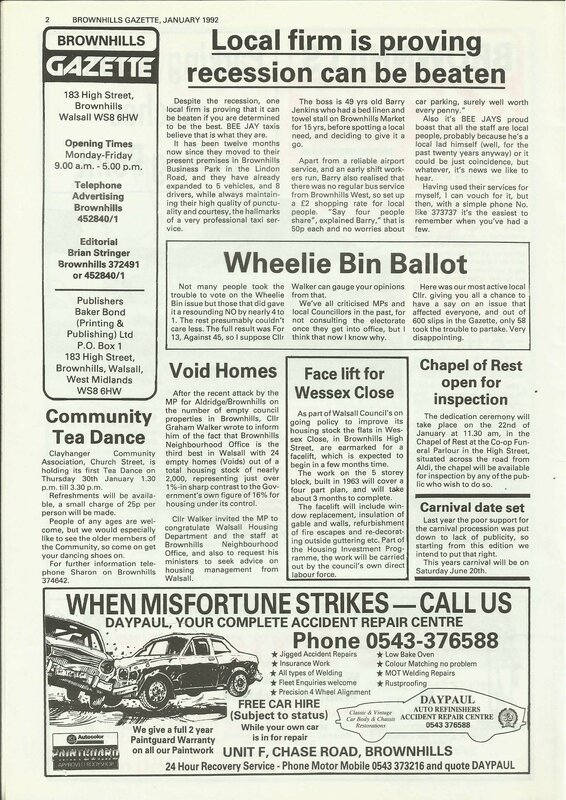 Bin leaflet part two – click for a full-size version. You can find out more and apply for a larger bin at the Walsall Council Bins beside here. I noted last night some hysteria about this on social media – so much so that the website crashed – for heaven’s sake people, it’s a bin. This manner of collection and volume seems to be becoming standard over the UK, and on the whole Walsall’s refuse collection services are pretty good. Nobody will die and it’ll just take a bit of getting used to, but I’m sure like the abject panic when wheelie bins then recycling were introduced, it’ll just slip into normality before long. This entry was posted in Bad Science, Brownhills stuff, Clayhanger stuff, Environment, Events, Interesting photos, It makes me mad!, Just plain daft, Local media, Local politics, News, Reader enquiries, Shared media, Social Media, Spotted whilst browsing the web, Walsall community, Walsall Council, Walsall Wood stuff and tagged 2016, Aldridge, bi-weekly, bin collections, Bins, Brownhills, changes, Clayhanger, collection, collection day, Events, household waste, information, Leaflet, Local politics, new, panic, Recycling, Refuse, rubbish, schedule, Silly, Twitter, Walsall, Walsall Council, Walsall politics, Walsall Wood. Bookmark the permalink. We have had fortnightly collections for years in Lichfield.